This is the latest in an ongoing series examining key factors that lead to repeated Super Bowl success. Some articles will focus on specific teams. Others will examine a particular facet or trend of note. Super Bowls have been played for the last forty-eight years. The types of champions have ranged from the teeth-breaking Pittsburgh Steelers and Oakland Raiders to the sleek sports car offenses of Kurt Warner’s St. Louis Rams and Peyton Manning’s Indianapolis Colts. Despite coming in so many shapes and sizes, there are certain truths we can learn by examining the collection of winners in their entirety. To that end, I have compiled the key statistics of every Super Bowl winner, and will share some striking findings. There is so much to cover, we will have to take it in bite-sized pieces. 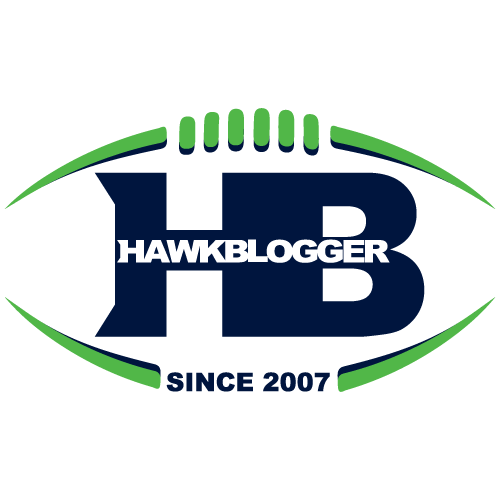 We will start by seeing what the composite of a Super Bowl winner is (i.e., averaging the regular season numbers of every winning team), and how the 2013 Seahawks fit, or broke from, the norm. It is easy to make a mistake after a few hours of crunching numbers in Excel. That is why I had to go back and triple check the results after finally seeing what the average Super Bowl Champion produced in the regular season, and then seeing where the Seahawks stacked up. This was just odd. 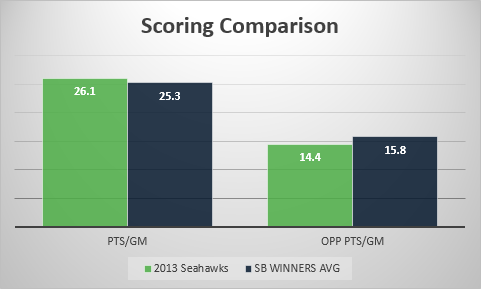 The uncanny similarities between the 2013 Seahawks and the average Super Bowl winner does not stop there. Nearly every major number I crunched looked almost identical across the two. That column on the left includes the Seahawks, but also includes Joe Montana’s 49ers, the late 60s Packers, the undefeated Dolphins, and every other team that ended the year with a ring. The game has changed significantly in the last five decades, but what Seattle did in 2013 was classically championship material. One of the line items that blew me away the most was the run percentage. That is, the percentage of offensive plays that these teams ran the ball. In a future article, I will share the trends across decades for some of these numbers. For now, I can tell you that there is a clear trend toward winning teams being heavily slanted toward passing offenses. In fact, Seattle is the first Super Bowl winner to run the ball at least 52% of the time since the 2005 Steelers, and only the second winning team to reach that mark in the last 23 years. 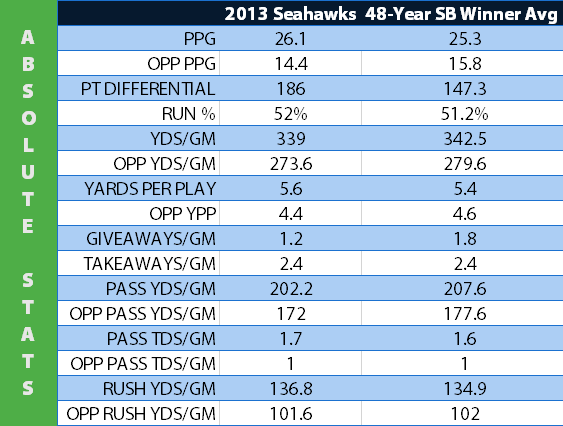 Before 1993, teams that won it all and run less then 2013 Seahawks were the aberration. Time will tell if Seattle is turning back the clock, or if they will increase their ratio of passes to runs. Just having Percy Harvin healthy catching swing passes could dramatically shift that ratio without greatly changing the ball control nature Pete Carroll values. Seattle stood out from past champions in scoring defense (-1.4 PPG below the average) and protecting the football (-0.6 fewer giveaways per game). There were no aspects of the team that were clearly below championship level. But these were absolute numbers. It helps to also look at relative numbers. We can get at that a little by seeing the rankings for these stats within the NFL. Throwing for 202 yards in 2013 surely ranks differently than it would have in 1974. Rankings can help to see where championship teams were most dominant. Here, we can start to see some separation and what I would call the profile differences between the Seahawks and a typical champ. Note that a lower number here is better. Being ranked #1 in the NFL in these numbers is a good thing. 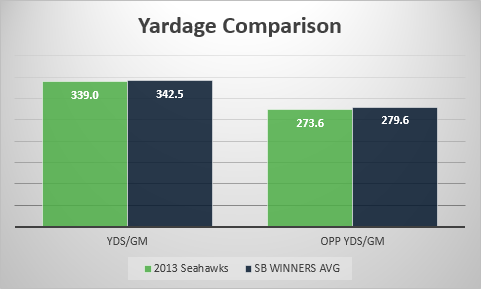 So when you see the Seahawks ranked 17th in yards per game on offense, compared to ~8th for the average SB winner, it tells you that the Seahawks leaned less on their offense than what has been the norm. Similarly, you can see that Seattle stands out defensively relative to their peers. They ranked #1 in opponent scoring, yards per game, takeaways and passing yards compared to 5.3 (OPP PPG), 6.6 (OPP YPG), 8.6 (TAKEAWAYS), and 10.6 (OPP PASSING YDS) for the average winner. Paying too much attention to either the rankings or the absolute numbers can lead to the wrong conclusions. Seeing that Seattle ranked so much lower in passing yards (#26) compared to the normal winner (10.5) could cause someone to think Seattle threw the ball far less than the average champion. But if you take a look at the absolute passing yard numbers and the run play percentage, it will tell you that Seattle gained almost exactly the same amount of yardage through the air and ran the ball almost exactly as many times as the average. The game has changed to where those numbers rank far lower now. A team that passed for Seattle’s 202.2 yards per game would have ranked #13 in 1985, but was #31 last year. The biggest takeaway from these numbers is that Seattle was already functioning exactly as a Super Bowl Champion should last season. They could not have mimicked the characteristics of a composite winner any better if they had commissioned a plastic surgeon. Where Seattle did differ was a stronger than normal defense, better protection of the football, and an offense that was a little weaker than what has normally been needed. Seattle’s defense could take a step back and still be well within the norm for a champion, and the Seahawks offense is primed to step forward. 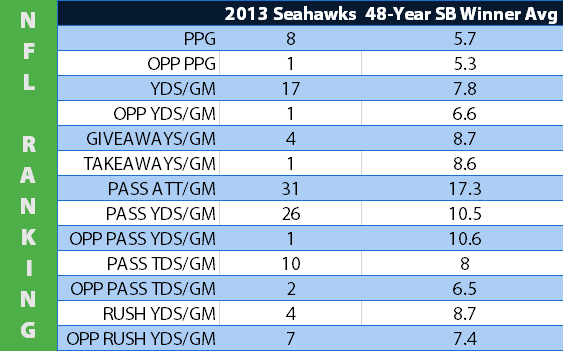 Pete Carroll has molded his team in the shape of past dynasties, and the numbers show he has done a masterful job of it.